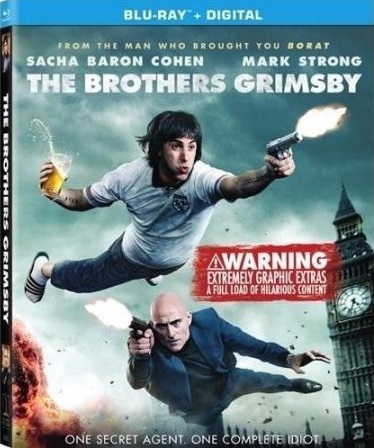 Nobby (Sacha Baron Cohen), a sweet but dimwitted English football hooligan, has everything a man from the poor fishing town of Grimsby could want, including nine children and the most attractive girlfriend in Northern England (Rebel Wilson). There’s only one thing missing: his little brother, Sebastian (Mark Strong), who Nobby has spent 28 years searching for after they were separated as kids. Nobby sets off to reunite with Sebastian, unaware that not only is his brother MI6’s deadliest assassin, but he’s just uncovered plans for an imminent global terrorist attack. On the run and wrongfully accused, Sebastian realizes that if he is going to save the world, he will need the help of its biggest idiot. Nobby is a slacker, who lives with his girlfriend, nine children and a few grandchildren in the small village of Grimsby. He’s convinced that one day he will find the brother he was separated from 28 years earlier. When a friend of a friend locates his brother, Sebastian, Nobby goes off to find him. In the 28 years they’ve been separated, Sebastian has become one of MI-6’s most valuable assassins. He’s on a job in London when Nobby finds him, and he unfortunately makes a crucial mistake which leads everyone to believe he is a murderer and has plans to bomb a big world event. Sebastian realizes that he’s got nowhere to hide, so he agrees to go back to Grimsby with Nobby, who promises that no one will know he’s there… after a big party and a huge sign in the town square welcoming him back. Now that MI-6 knows he’s there, Sebastian has to escape again, and with the help of a colleague, who is a little more than a friend, he and Nobby set out to find the real killer and terrorist, who is hiding in South Africa. After arriving in South Africa, Nobby innocently drugs Sebastian and ends up having to take his place on the mission. He’s found out and after Sebastian saves him, the two are once again running for their lives. Finally, they figure out where and how the bomb is going to be set off, and after Nobby tells Sebastian what really happened the day they were separated all those years ago, Sebastian embraces his family and together, he and Nobby sacrifice themselves and save the world… with a little help from Nobby’s family and friends, of course. I was so disappointed in this movie. I think I expected another Borat. What I got were few laughs and a couple of gagging moments in a not-the-worst story. I know nothing will ever live up to the hilarity of Borat and I should have known better than to expect something equal to it. 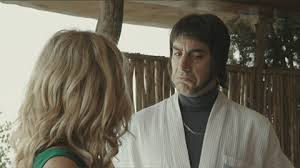 Don’t get me wrong, Sacha Baron Cohen was funny as Nobby. He always embraces his characters in such an all-encompassing way that it’s easy to forget that he’s an actor and not really the character. Mark Strong is a great MI-6 assassin and portrayed Sebastian really well. He was equally terrifying and appealing, and I’d hate to meet him in dark alley or have him chasing me. Isla Fisher is always so good in her roles and Rebel Wilson was the best part of the movie. She’s so funny and always delivers her lines in a way that makes you laugh. The widescreen presentation of the Brothers Grimsby was good. Probably the best part of the movie was the color scheme and the way the movie was filmed. It played like a spy movie and the action scenes were shot well. The colors used were bright where needed and muted at other times, but they all blended well together. Skin tones were natural and everything looked authentic. The English 5.1 DTS-HD master audio was really good. Accents were clean and clear and the flow of the dialogue was even. At times, there are a lot of people talking at once (not just in scenes where they are cheering for their soccer team) and the viewer can hear exactly what is meant to be heard in the scene. Other languages available are English audio descriptive service, French 5.1 DTS-HD master audio, and subtitles in English, English SDH, French and Spanish are available. The special features included were interesting; though the deleted scenes with the elephants and the investigator were over-the-top gross and I sat on my couch gagging. I did find the gag reel funny and wished that was longer. The Making of The Brothers Grimsby (11:50): Interviews with the cast and crew about the movie and how it ultimately got made. The Elephant in the Room (4:21): How the elephant scene was filmed. While there were a few funny moments, in general The Brother’s Grimsby was a big disappointment. I was grossed out to the point of actual gagging and the movie just didn’t live up to my expectations. I likely won’t watch this again, but for big fans of Sacha Baron Cohen, this will likely end up in your movie collection.